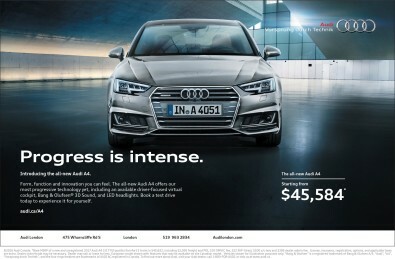 SportsXpress London : Automotive : : Introducing the all-new Audi A4. Form, function and innovation you can feel. 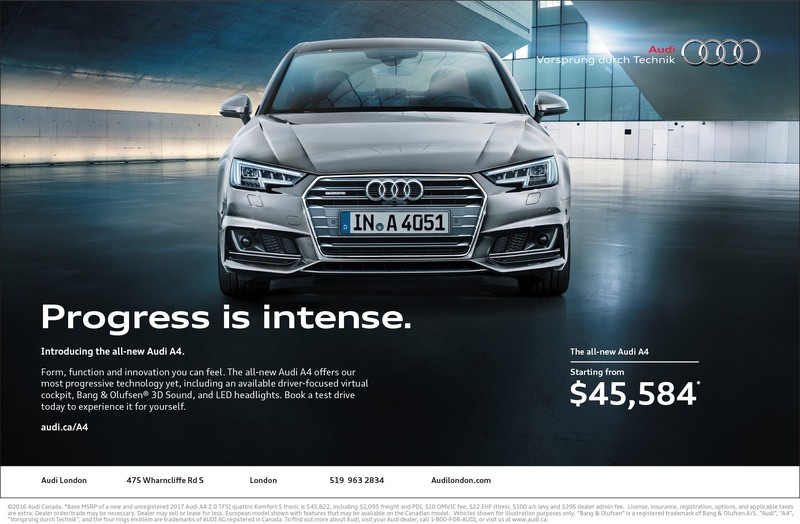 The all-new Audi A4 offers our most progressive technology yet, including an available driver-focused virtual cockpit, Bang & Olufsen® 3D Sound, and LED headlights. Book a test drive today to experience it for yourself. ©2016 Audi Canada. *Base MSRP of a new and unregistered 2017 Audi A4 2.0 TFSI quattro Komfort S tronic is $45,822, including $2,095 freight and PDI, $10 OMVIC fee, $22 EHF (tires), $100 a/c levy and $395 dealer admin fee. License, insurance, registration, options, and applicable taxes are extra. Dealer order/trade may be necessary. Dealer may sell or lease for less. European model shown with features that may be available on the Canadian model. Vehicles shown for illustration purposes only. “Bang & Olufsen” is a registered trademark of Bang & Olufsen A/S. “Audi”, “A4”, “Vorsprung durch Technik”, and the four rings emblem are trademarks of AUDI AG registered in Canada. To find out more about Audi, visit your Audi dealer, call 1-800-FOR-AUDI, or visit us at www.audi.ca.